Six Windows Phone 7 handsets were unveiled in London yesterday (the US got nine) and they’ll all be here in time for Christmas. But as I strolled around Microsoft’s press event I couldn’t help but feel a bit of deja-vu. I really like the look of the new Windows Phone 7 (WP7) operating system. It strikes me that Microsoft has managed to shake off many of the foibles that the previous Windows operating systems have had. What’s more, with Microsoft stipulating a series of minimum spec requirements, we now have six impressively-armoured mobile phones coming our way. Indeed, the difficulty now is telling them apart from one another. When I asked each representative what set their WP7 phone apart, the answers varied from ‘it has a screen that’s 0.3 inches bigger’, to ‘it has 16GB rather than 8GB of internal memory’. Though I must concede that the Dell phone’s slide-out keyboard was slightly refreshing. The differences were all relatively minor, particularly when the heart and soul of the handsets was an operating system that Microsoft wouldn’t let anyone doctor. This interface makes them all look nigh on identical if you ignore the manufacturers’ hubs that popped up on a few screens. My hypothesis is that, given Microsoft’s track record with mobiles, making a phone with their new Operating System was a risky proposition. So rather than going all guns blazing, the manufacturers were keen to hit Microsoft’s minimum requirements and didn’t dare go too far past them. 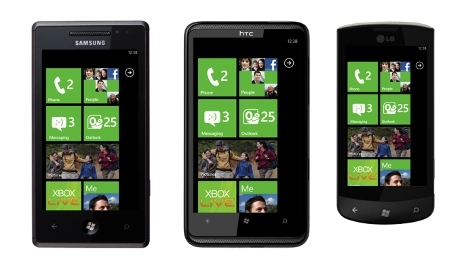 If these phones are well-received, then perhaps we’ll see something more stand out-ish in the next wave of WP7 devices. But, for me, the current WP7 phones were all a bit samey. Very good, but samey. Ben Stevens and Jon Barrow can be found talking on the Which? Tech Daily about Microsoft’s latest foray into mobile phones space.